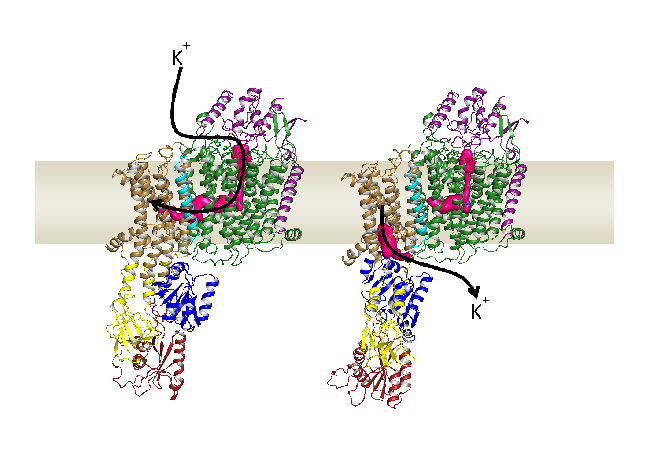 Outward and inward facing structures of KdpFABC in cell membranes. Credit: Inga Hänelt research group. For decades it was assumed that protein channels and protein pumps fulfilled completely different functions and worked independently of each other. Researchers at Goethe University Frankfurt and University Groningen have now elucidated the transport path of a protein complex that combines both mechanisms: it first receives potassium from the channel and then transfers it to the pump, from where it is transported to the cell. Since both protein families – channels and pumps – carry out very different functions, they have always been described as separate from each other. This, however, is contradicted by the observation that KdpFABC, a highly affine, active potassium uptake sys-tem of bacteria, does not represent a simple pump, but is constructed of a total of four different proteins. One of these is derived from a typical pump, while another one re-sembles a potassium channel.